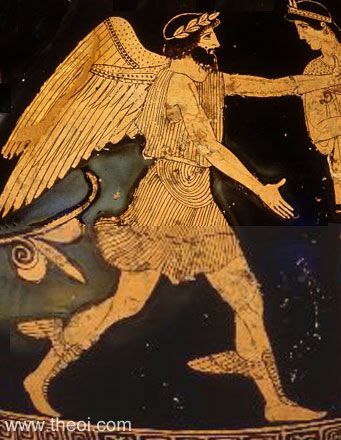 Side A: Boreas, the winged god of the north-wind, pursues the Athenian princess Oreithyia in the presence of the goddess Athena. The god has winged shoulders and winged boots, and is crowned with a wreath. 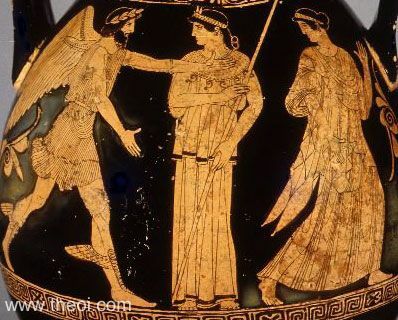 Side B: Oreithyia's sisters, Pandrosos and Agraulos, run to their father King Erechtheus (not shown). Detail of the god Boreas.